Goals from Ashley Barnes and Chris Wood gave Burnley a 2-1 win yesterday at The Hawthorns against bottom of the league West Bromwich Albion to take us to 46 points and retain seventh place in the league ahead of Leicester City. The Hawthorns has always been a favourite ground of mine. I’ve no idea why but it is something I’ve often referred to in match previews ahead of games there before coming home usually with yet another defeat. Maybe it harks back to my early days as a Burnley supporter when, alongside Filbert Street, it was noted as being one of our best away grounds. I suppose there is no better time to go there. They are bottom of the league, and by some distance. They have won only once since August, that a 2-0 home win against Brighton in mid-January, and it would take a miracle of biblical proportions for them to even bring about a relegation battle now in the remaining games. Other than a desperately needed stop and a short hold up on the M5, it was a trouble free journey down and we were parked up close to the motorway around an hour before kick off with the team news just coming through showing two changes. As I expected, Chris Wood got his first start since before Christmas. He replaced Jeff Hendrick who was on the bench. The other change was perhaps a surprise. Jόhann Berg Guðmundsson didn’t make despite everything looking favourable on Thursday, and that meant a first start for Tottenham wide man Georges-Kévin NKoudou. There’s a really depressed feel about the place right now and no surprise given their predicament. There was no sign of any protests, and we certainly weren’t to be entertained with any pitch invasions, but they seemed to have just accepted the inevitable that they won’t be playing Premier League football next season. In their last game they’d played as well as they’ve played in some time and looked set to win at Bournemouth. Two late goals, with one very late winner from former Claret Junior Stanislas, put paid to that as they went down 2-1. However, Alan Pardew kept faith with the team that played in that game, naming an unchanged team which meant an appearance against Burnley for another former Claret Jay Rodriguez who received, shall we say, a very warm reception from the visiting fans. We started well and dominated much of the first half in which we took total control of midfield with both Ashley Westwood and Jack Cork outstanding. In fairness, West Brom were dreadful but you can’t only beat what’s put it front of you and the only surprise was that it took us until the 22nd minute to gain a goal advantage. Westwood was involved with that opening goal, one of a number of players in another well worked move. It was Westwood who played the final ball out to Aaron Lennon on the right. What a start he’s made to his Burnley career and this was another superb performance from the former England winger. His cross was perfect but the plaudits have to go to Ashley Barnes who scored probably his most stunning goal yet in a Burnley shirt. I don’t think I can quite find the words to describe what was just about an overhead kick. It was sheer brilliance from Barnes who has now scored in each of the last four Premier League games equalling the achievement of Sam Vokes who scored in each of the last three games of last season and then made it four with his brace at Chelsea on the opening day of this season. That it was still only 1-0 as we went into the last minute of the first half can be put down to a less than eagle eyed referee and a disappointing miss from Wood. Stood at the far end of the ground, it was impossible to see that Ahmed Hegazi was doing his utmost to get a souvenir shirt from England’s newest international James Tarkowski. As a ball came in from the left, only Probert will be able to work out quite how he missed what was nothing other than a clear penalty. Would Barnes or Wood have taken it? Based on Wood’s shooting a few minutes later we might have opted for Barnes. Set up beautifully by NKoudou, he screwed his shot wide when I think we all expected him to plant it into the bottom corner. Never mind, we were still a goal up and cruising; that was until just before the break when the home side would have been level with a Salomon Rondon header but for a very good save from Nick Pope by his left hand post. We’d been head and shoulders better than the beleaguered Baggies and there was nothing to suggest, and certainly not an Alan Pardew team talk, that things would change after the break. In truth, it was a much more even contest. There were a couple of concerning moments although, in truth, nothing to worry us too much, but eventually, midway through the half, we started to come right back into it and gave the home side a very difficult period that culminated in the second goal. It started with a long kick out from Pope that a West Brom defender won in the air from Wood. It dropped for Jeff Hendrick, on as a substitute, but he lost the ball in a challenge. I thought it might have been a foul but as it happened the ball ran loose to Matt Lowton and he slipped a delightful pass into the box for Wood. The striker jinked past a defender before hitting a left foot shot that was saved by Ben Foster but only enough for Wood to run in and head home from three yards. From the away end, as soon as you saw Wood you knew it was 2-0, it was all but impossible to miss. It looked that way on the pitch too; Lowton was seen starting to celebrate the goal even before Wood had made contact with his head. The celebration was muted from the striker against his former club but not so the response from the Burnley fans for our former striker Rodriguez who was substituted before the game restarted. Apparently he remains one of our own. It looked, to all intents and purposes, as though we were just going to run the clock down on a win that, in so many ways, was much easier than the 3-0 win at West Ham in the last game. That was until seven minutes from the end when Rondon turned Tarkowski just inside the box and fired home a left foot shot. Twice, once in the remaining minutes and once in the six minutes of time added on, they came perilously close to equalising. The first saw the ball drop for Brunt but Lowton got in a tremendous block and then, with time almost up, they fired a ball right across the box from the right that went out for a goal kick. Finally, the whistle blew, the points were ours and, make no mistake, any result other than an away win would have been a rank injustice. We were, over the game, by far the better of the two sides. For us, it is still three points clear in seventh place but, following Arsenal’s win today, still five points behind sixth. 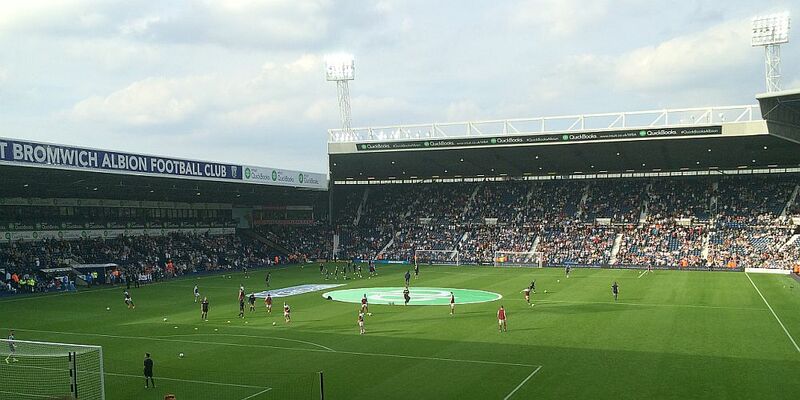 For West Brom, Championship football is all but certain to return to The Hawthorns next season for the first time since 2010. Embed from Getty ImagesYou would hope by then that someone might have explained the laws of the game to their players. When Rondon was flagged offside in the second half, the free kick was rightly awarded to us in the West Brom half with Rondon having gone back to play it. You know that the crowd will react. Despite the fact that this particular law has been in place for nearly two seasons, it doesn’t seem to have caught on. But you do expect the players to understand. Rondon remonstrated but Brunt picked the ball up and moved it back into our half of the pitch. Probert just laughed but it was astonishing that there was no yellow card for Brunt. So, it is a favourite ground of mine; I can say that now although we won’t be playing there for at least one season in the league. This was the club who we all thought we should try and mirror at one time, a sensibly run club who, after going up and down a few times, had begun to establish themselves in the Premier League. Then the club was sold. There’s a moral to that story. At least we are back to playing on a weekly basis again now after the recent break. It’s off on our travels again next week and potentially a date with another ex Burnley striker before finally getting a first home game in six weeks in the following game. Once again there was so much to be admired in this performance. For most of the game we were solid at the back and I thought the two central midfielders were in control with Westwood the pick. And then there was Lennon who has added a new dimension to our play. Six away wins now this season; that’s one more than we achieved in the three previous Premier League seasons, and we haven’t even had to go to Hull to get a win this season. It was a change of plan for us yesterday, and the pub/food stop was on the way back. It was a late return to Burnley but who cares after a win. What a fantastic time it is to be a Burnley fan. West Brom: Ben Foster, Allan Nyom, Craig Dawson, Jonny Evans, Ahmed Hegazi, Kieran Gibbs (Matt Phillips ht), Jake Livermore, Claudio Yacob, Chris Brunt, Jay Rodriguez (Oliver Burke 74), Salomon Rondon. Subs not used: Boaz Myhill, Gareth McAuley, Grzegorz Krychowiak, Ali Gabr, James McClean. Burnley: Nick Pope, Matt Lowton, James Tarkowski, Ben Mee, Stephen Ward, Aaron Lennon, Ashley Westwood, Jack Cork, Georges-Kévin NKoudou (Jeff Hendrick 69), Chris Wood (Sam Vokes 77), Ashley Barnes. Subs not used: Anders Lindegaard, Phil Bardsley, Kevin Long, Charlie Taylor, Dean Marney. Yellow Cards: Ashley Barnes, Jack Cork, Nick Pope. Attendance: 23,455 (including 2,704 Clarets).